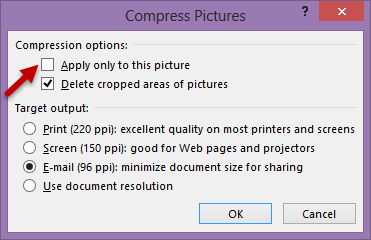 It means apply the compression to ALL pictures in the presentation. It is good enough for on-screen presentations in most cases although it mentions 150 ppi as the recommended setting. Now save the file. That’s it! This method works with Word and Excel as well. Warning: Try this on a COPY of the original file. Compare the results of before and after and then choose if the compressed visuals are acceptable. Remember, when you save and close the compressed file, you cannot undo the changes. Oh, this is not a bug. PowerPoint automatically compresses ALL images automatically to 220 ppi. This happens behind the scenes and you don’t have to change any settings. 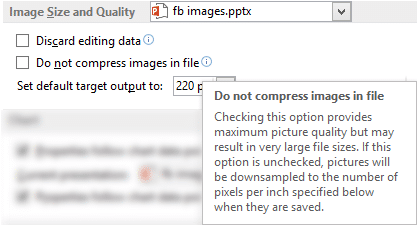 So if you really WANT TO SHOW high resolution pictures, then you must choose the setting Do not compress images in file. This is a file level setting. It affect ONLY the currently open file. The setting is there in File – Options – Advanced. If you save the file BEFORE changing the setting, all your high-resolution images are already been downgraded to 220 ppi! Changing this setting after saving the file has no meaning. Previous PostOffice Politics Secrets: Practical use of Track ChangesNext PostOffice Politics: How to enable Track Changes without the other party knowing it!